You have heard us share our love for our Food Processors. They aren’t necessarily a cheap kitchen gadget, but I use mine on a weekly basis. Check craig’s list, ebay, garage sales, or even your mother’s basement. It’s vital that it has a sturdy & sharp blade, large bowl and powerful motor. They are perfect for whipping up almond (cashew or pecan) butter, salsa, pesto, healthy ice cream and more. 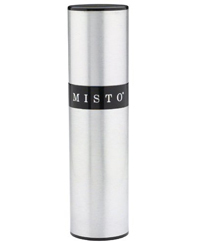 Olive Oil Mister-you can find them online or at any kitchen store for about $15. When I am cooking I would much rather use olive oil than a can of “natural” cooking spray that includes grain alcohol and propellant (read the label!) Just pour your Extra Virgin Olive Oil into this mister and pump air pressure in and spray as needed. It’s great for coating skillets on the stovetop or baking in the oven. And you control the amount of olive oil you are using instead of just pouring it all around. 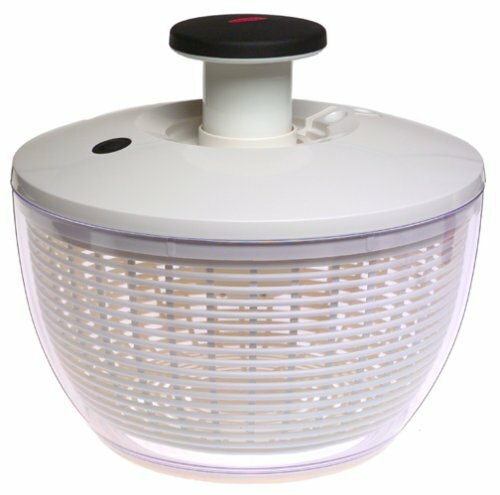 Salad Spinner-I used to just use my colander to rinse spinach, kale and other leafy greens. I thought they were rinsed properly, but it amazes me how much water the spinner draws out. It does take up a lot of cabinet space but when you are dressing a salad or baking kale in the oven, the last thing you want is watery leaves. You can use the bottom container as a bowl to store or serve your greens as well. Garlic Grater Dish-I’ll admit I was skeptical about this but it’s one of my favorite kitchen tools. It is so simple and easy to use and is only a few inches around. 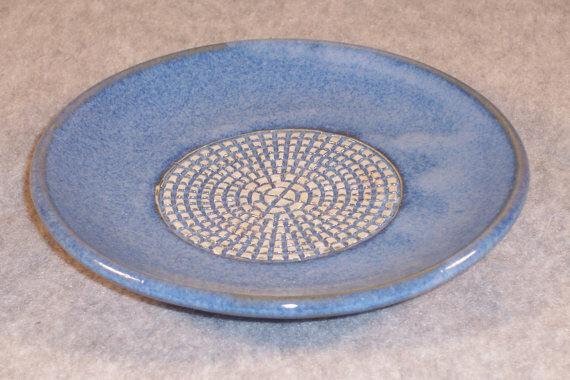 All you have to do is simply place the food item of your choice on the plate and rub it against the grainy surface and in seconds your food will be finely grated. Garlic is so small and it’s a harder cleanup in my mincer, my little dish works wonders. The grate is also so small you don't have to worry about getting big chunks of garlic in a bite. It works great on garlic, ginger, chocolate, cheese, nuts, nutmeg, and more. 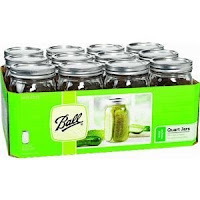 Mason Jars-Ok, it’s not really a gadget, but we buy these by the caseful! I like to put almond butter in the half pint size, nuts in the pint and granola and dried beans in the quart size. Glass jars keep the products fresh and safe and the lids & rings are interchangeable (unless you purchase the wide mouth ones). A case usually runs about $10 and they are great for drinks (remember Carrie’s party post) supplies, crafting gifts and countless storage options. Plus those reusable plastic containers get pretty dingy after a lot of uses, not to mention the breakdown of plastic seeping into your food! What are your favorite kitchen gadgets that you can’t live without? I was a Pampered consultant for 9 years so it is hard to pick one gadget. But I have to say I love my little can strainer. It fits in a can of tuna and allows me to drain the water easily.